This demo video demonstrates the features of the VM-HD4 HD CCTV multiplexer from CCTV Camera Pros. Click here to learn more about the VM-HD4 HD-TVI Multiplexer used in this video. The VM-HD4 works with all AHD CCTV cameras on this page as well as any 720p or 1080p HD-TVI camera on this page. This is the quad camera view of 4 HD security cameras connected to a VM-HD4 CCTV multiplexer, also known as a quad video processor. Next, I will switch the output to single camera view and select each camera one by one. Cameras 1 and 4 are 1080p resolution TVI cameras. Cameras 2 and 3 are 1080p resolution AHD cameras. This is the other 4 camera view that is available. This is the picture-in- picture view. This HD multiplexer also has horizontal and vertical layout options for dual camera views. I am changing the screen view of the multiplexer using the wireless remote control that is included. Next, I will access the menu system of the quad using the wireless remote control. 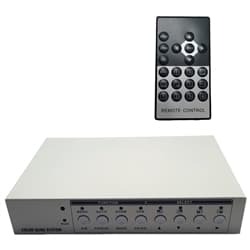 On the input settings screen users can configure each input channel for analog CCTV, AHD or TVI type security cameras. Cameras based on NTSC or PAL video standards can be used. On the display settings users can configure the resolution of the HDMI and VGA monitor output. On the image settings screen users can adjust the brightness, contrast, saturation and hue of each camera. On the auto sequence settings page the hold times can be adjusted for each camera. The picture-in- picture settings control which video channel is used for the main and sub-screen. Here’s how the VM-HD4 is set up. Up to 4 security cameras are hardwired to it. This is typically done using Rg59 coax cable. The quad has an HDMI and VGA video output that can be used to connect to an HD television or computer monitor. The video output of the quad is controlled using the wireless remote control or the buttons on the front of the quad itself. Here are some of the main features of the VM-HD4. It has 4 BNC video inputs. Each of those inputs can accept video from analog CCTV, AHD and TVI type security cameras. The unit can run in NTSC or PAL video standard modes. Users can select between 4 camera, 2 camera, single camera and picture-in- picture views. There’s an HDMI and VGA video output. A wireless remote control is included with this unit. For current pricing and additional information please visit www.cctvcamerapros.com/HD4. Thank you for watching.